Retrocalcaneal Bursitis. This bursa is located at the back of the heel. Bursitis in this area is often associated with conditions such as ankylosing spondylitis or rheumatoid arthritis. It can occur in healthy individuals who wear improperly fitted shoes. 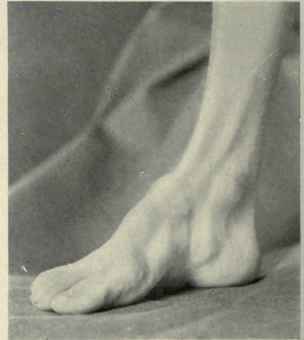 Symptoms include painful swelling that develops at the back of the heel. 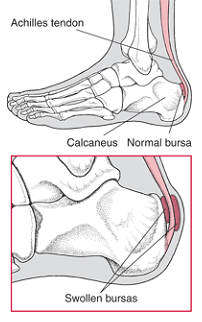 Calcaneal Bursitis. This bursa is located at the sole or bottom of the heel. Inflammation usually produces pain in the heel when standing. Causes include heel spurs, excess weight, injury, and wearing improperly fitted shoes.